Toy Nippon: BBTS News: Transformers, Marvel, Mortal Kombat, Star Wars, Nintendo, DC & More! 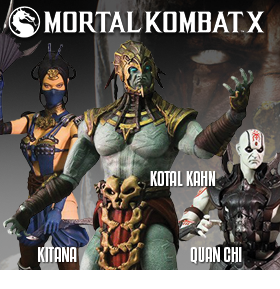 BBTS News: Transformers, Marvel, Mortal Kombat, Star Wars, Nintendo, DC & More! 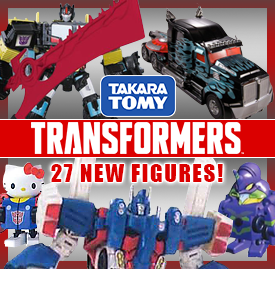 We have 27 new preorders open for Takara Transformers. This list features The Lost Age Black Knight Exclusive Leader Class Optimus Prime for $89.9, the Legends LG14 Ultra Magnus for $69.99 and continues with a bunch of new additions to the Transformers Adventure lineup and the Q “Cute” series Transformers. Towering over two feet tall, the imposing ruler of the planet Apokolips lords over its war-torn and fiery terrain with an iron fist. As the formidable Omega Sanction burns bright in his eyes, the merciless tyrant seeks the Anti-Life Equation and – in turn – the means to usurp free will from all sentient life in the universe. This Leader Class Black Knight Optimus Prim is a redeco of the previously released AD-31 Armor Knight Optimus Prime. He has a really cool black finish with teal flames and chrome accents. This Ultra Magnus is a Japanese repaint of the leader class Ultra Magnus. He stands over 9 inches tall in robot mode and transforms into a truck and trailer. Transformers Adventures figures are compatible with the Japan only app game that allows you to scan your figure to make it a playable character in the game. We have a total of 13 brand new figures in the Transformers Adventure line ranging from Legends all the way up to Leader class sizes with prices ranging from $12.99 to $59.99. These figures are made of plastic, can transform between robot and vehicle modes, and are about 2 inches long in vehicle mode. These tiny transformers are listed for $9.99 each. We also have the new QTC 01 Hello Kitty for $11.99 and the QTC02 Evangelion Three Pack for $29.99. Bumblebee is one of Optimus Prime's most trusted lieutenants. His luck, determination, bravery and willingness to give his life to protect others and stop the Decepticons more than makes up for his not being the strongest or most powerful of the Autobots. These premium busts from Prime 1 Studios feature LED light-up eyes and comes in three different versions, one from each of the first three movies. These 1/8 scale reproduction figures of Celty Sturluson, Izaya Orihara, and Shizuo Heiwajima from the Japanese anime series “Durarara! !” are pre-painted and made of PVC and stand just over 8 inches tall. They come with a base and optional accessories. Premium Bandai and Sun-Star Stationery have created a beautiful Sailor Moon Prism Stationary Antique Style Clip Case based on the Holy Grail of legend that appeared in the anime Sailor Moon S. This Clip Case is made of metal with glass gems and has a very beautiful red and gold metallic finish. When you open the lid you’ll see the silver crystal inside, and in the hidden compartment below the crystal there is space for holding the 12 moon and star shaped paper clips that are included. The silver crystal contains a hidden magnet that will hold a few paper clips so they are always at the ready. Bravest Warriors is an American animated web series set in the year 3085 that follows four teenage heroes-for-hire as they warp through the universe to save adorable aliens and their worlds using the power of their emotions. We have Catbug and Impossibear in Pop! style for $9.99 each and Catbug in the Pocket Pop! Keychain for $5.99. HX PROJECT in collaboration with XM-Studios and Hand Made Objects ( H.M.O.) is proud to present, the all mighty THOR. A highly stylized design and technically engineered piece in the 1/6th scale, makes it compact and highly collectible. See the battle unfold in front of your eyes and observe the power of the God of Thunder! The Marvel Zombie Mysterio Mini Bust features the zombified master of illusion with his greatest asset exposed, HIS BRAIN! With cracked dome, bloody grey matter, and entrails spilling out, this horrifying creature no longer needs parlor tricks to frighten his foes. 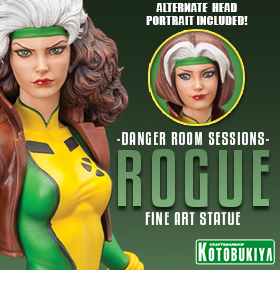 Crafted using only the highest quality polystone, each limited-edition, hand-painted mini bust comes individually numbered and is packed with a matching certificate of authenticity. The ARTFXJ line is a bold expansion designed “to bring classic Japanese characters to their fans worldwide” and the latest addition is the horror manga and anime property Tokyo Ghoul - the story of a young man who’s turned into a half-ghoul and discovers a world he never knew existed. Ken Kaneki is sculpted in the tattered remains of his human life with the horrific ghoul mask crawling up his neck and his “Kagune” tentacles protruding from his back. The statue is 1/8 scale at nearly 9 inches tall on his integrated rubble base. These highly detailed historical action figures from 303 toys feature real fabric clothing and authentic looking weapons. We have just listed some new and unique items from Enesco that are based on the hit Disney film Frozen. The cute Little Princess Anna and Elsa figures have a glitter detail and are listed for $24.99 each. See the show stopping moment when Elsa declares her true self to the world with Elsa’s Cinematic Moment for $149.99; and greet the main cast of characters crafted in rich detail out of Birch wood from the forests of Scandinavia with the Carved by Heart Statue for $89.99. Protect your hard-earned cash with these 8 inch tall rotocast bust banks made of hardened rubber with detailed paint applications. From the Batman universe we have Catwoman, Robin, The Penguin, and The Riddler for $16.99 each and from The Avengers Age of Ultron we have Hulkbuster for $17.99 as well as Iron Man and Ultron for $16.99 each. We also have Ant-Man for $16.99. These marvelous action figure 3-packs feature key players from the broad spectrum of characters appearing in the decades spanned by the long-running sci-fi TV series. This set of 3 three packs includes Donna Noble, The Narrator, and River Song from “Silence in the Library”; Prisoner Zero, Raggedy Doctor, and Rory Williams; and Corroded Cyberman, the Eleventh Doctor, and Silent. This collection features battle worn and “reject stamped” Daleks from the Eleventh Doctor’s adventure “Asylum of the Daleks”. This action figure set contains a dark red metallic Paradigm Drone Dalek, a white Paradigm Dalek Supreme, and an electronic talking bronze Dalek. Discovered in the Mongolian desert in the 3rd century BC by the father of Taoism, Lao Tzu, Z-Girl is a highly functioning zombie with both a consciousness and a conscience. A fierce warrior, Z-Girl is humanity’s last hope against extinction. This 1/6 scale figure comes with a bunch of cool weapons and accessories. To celebrate the classic Capcom game Alien vs. Predator, Funko & GTS Distribution have created the ReAction Arcade Predator figure. Predator wears a vintage-style paint deco and is limited to 5,000 pieces worldwide. Don’t miss out on this classic sci-fi hunter! A PREVIEWS Exclusive! Deadpool is decked out in his gray X-Force costume for this 6" tall Wacky Wobbler! Deadpool stands on a name display base and features moveable arms. Who gives a thumb’s up for adding him to your collection? …this guy! Scalers are collectible mini figures for your cords and cables, featuring iconic characters from movies, video games, TV and comic books! These adorable minis grip headphone cords, device cables and more, and feature an amazing level of detail. The Avengers Age of Ultron Series 01 includes Captain America, Thor, Iron Man, Hulk, and Ultron. We have them in a set of 5 for $24.99 or individually for $4.99 to $5.99 each. Enjoy hours of body-bobbling fun that’s powered by the sun! Body Knockers stand 6 inches tall and rock from side to side when exposed to light - they never need batteries! Dance the day away with your very own Thor, Captain America, Iron Man and Hulk from The Avengers Age of Ultron. These Head Knockers by NECA are over 7 inches tall, cast in resin and hand painted for incredible detail. Each stands on a themed base with a bobbling head. Add some fun to your desk with Thor, Captain America, Iron Man and Hulk from The Avengers Age of Ultron. Superbad, the original Judd Apatow bromance film, is coming to Pop! The series includes best buds Evan and Seth, as well as McLovin, who sounds like he must be an Irish R&B singer and has the ID to prove it. McFarlane Toys continues its partnership with Ubisoft to create action figures from the blockbuster Assassin's Creed® series of video games. Series 4 includes Shay Cormac, Arno (designed by Todd McFarlane), and Eagle Vision Arno all with outfits and weapons from the next chapter in the Assassin's Creed saga, Assassin's Creed Unity and Assassin's Creed Rogue. Get all three figures in a set for $37.99 or individually for $12.99 each. Between the River Anduin and the western eaves of Mirkwood lie the fertile lands of the mighty skin-changer, Beorn. Serving only himself, Beorn has built a sanctuary that he shares with a host of animals in the lush Anduin Vales. Beorn’s sturdy home of stacked stone and intricately carved wood nestles amid evergreen trees with wide views across the pastures on which his animal companions graze. This highly detailed miniature environment by WETA Collectibles is limited to 750 pieces. From the 2012 HD remastering of "ANUBIS ZONE OF THE ENDERS" ("Zone of the Enders: The 2nd Runner"), comes orbital frame Riobot Anubis, to display with your Jehuty! Anubis features pearl/metallic and matte paint application with generous, detailed markings all over. Inner joints utilize diecast for a high quality suited to a Riobot. The six large thrusters in his back are also moveable, lending to the figure's posability. This figure stands about 7 inches tall and includes a Rio-board base, Uasu rod, and two grip parts for the Uasu rod. Erwin Smith from "Attack on Titan" joins Sentinel's Brave-Act lineup! Raising an arm to direct his troops in attack, Erwin stands about 9.65 inches tall, and has two interchangeable facial expressions (intent face and screaming face). He can be displayed holding one of his blades in his outstretched hand and his head can also be rotated. 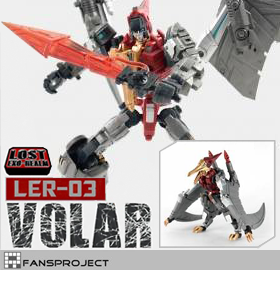 You can also choose to show him off with his Vertical Maneuvering Equipment or without. A black-and-gold version of the Combiner Wars voyager Optimus Prime, the paint job is based on Grand Scourge from "Transformers: Super Link" (the Japanese title for "Transformers: Energon"). Grand Scourge comes with a huge cleaver of a sword, named "Matrix Breaker". Chewbacca is Han Solo's copilot on the Millennium Falcon. The powerful Wookiee is a courageous fighter, skilled mechanic, and loyal friend who joins the fight to save the galaxy. This highly articulated figure includes his iconic gear and a textured fur sculpt that makes him look like he just walked out of the movie and onto your shelf! Reenact the action-packed battles between Oliver Queen and Slade Wilson from Season Two with this intricately sculpted, highly poseable Arrow action figure that stands nearly 7 inches tall. McFarlane Toys is bringing a revolutionary evolution in brick building toys based on television's most watched drama, AMC's The Walking Dead. Each piece is hand painted and compatible with other brands. The Prison Tower & Gate Set has 623 pieces and is listed for $62.99; Daryl Dixon with Chopper has 154 pieces and is listed for $19.99; Figure Pack 1 contains 5 figures with interchangeable parts for $16.99; and build a walker hoard or survivor group with the Blind Bag Case of 24 for $74.99 or Random Single for $4.99. The most powerful heroes in the universe, together in one box set! This set of the iconic Justice League characters from DC Entertainment - Superman, Batman, Wonder Woman, Green Lantern, The Flash, Aquaman, and Cyborg was created as a fundraiser for the We Can Be Heroes campaign in 2012. This cool tin tote lunch box is filled with seven action figures with interchangeable accessories and shields, an interactive workbook, a drawstring carry bag, and an adjustable bracelet you can attach the elemental shields to before wearing it. The figures are 4 inches tall with 9 points of articulation and they are: Bravery (Br), Honesty (Hn), Energy (Eg), Industry (In), Enthusiasm (Em), Persistence (Ps), and Fear (Fe). The Amazon Warrior Wonder Woman bursts out of the pages of the hit SUPERMAN/WONDER WOMAN comic book series and into your home with this wonderful statue based on the designs of superstar artist Tony S. Daniel! This version of the Amazon Princess is limited to 5200 pieces and stands over 8 inches tall. The Back to the Future Outatime Retro Style Tin Tote Lunch Box features different artwork on each side, including the iconic Space Zombies artwork from the cover of Sherman Peabody's Tales from Space 1955 comic book prop! This cool retro lunch box does not include a thermos. The WB01-D Whirlwind transforms from a robot to an assault helicopter and is one of the five figures that combine to form the mighty Warbotron, one of the tallest combiners created so far! Funko’s Fabrikations are 6 inch tall, soft sculpted figures that feature rotating heads and vinyl accessories and are filled with dense foam to achieve a high-end lush feel. In addition, each Fabrikation is weighted to allow the figure to stand securely on the surface of your choice. Age of Ultron Iron Man and Hulk are in stock now! Hot Toys is excited to present one of the cutest 1/4th scale collectible you’ll ever see - Little Groot from Guardians of the Galaxy! The movie-accurate Little Groot Collectible stands approximately 4.75 inches tall and features 3 interchangeable head sculpts, special paint application to reflect his distinctive appearance, and movable arms and body to recreate Little Groot’s dancing scene. Hot Toys is delighted to present the 1/6th scale Mark III (Construction Version) Collectible that will be an excellent addition to completing your workshop diorama! The collectible is specially crafted based on the image of the Mark III in the first Iron Man movie featuring fine sculpture, LED light-up functions, removable armor parts, metallic colored painting on the armor, and specially designed figure stage. Season 4 finds Rick Grimes and his fellow survivors continuing to seek refuge in a desolate and post-apocalyptic world and soon discover that there are greater forces to fear than just the walking dead. The Michonne, Carl Grimes, and Gareth figures are highly articulated and feature the likeness of each actor and come with multiple accessories. The Mud Walker figure features an amazing attention to detail and unique play-action for maximum fun! Get all 4 figures as a set for $54.99; we also have the Case of 12 for $159.99; and you can get Michonne, Carl Grimes, and the Mud Walker for $14.99 each. The Takara version of Autobot Tracks has a more metallic paint application and comes in Japanese packaging. This deluxe size figure transforms from robot to car. 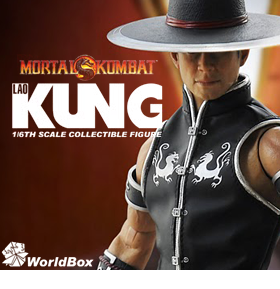 If you missed out on this great figure before, now’s your chance to add it to your collection! These detailed action figures come straight from Dawn of the Planet of the Apes, the sequel to 2011's Rise of the Planet of the Apes! Series 01 contains movie accurate, articulated versions of Caesar, Koba, and Maurice. The figures stand approximately 6" tall and come with interchangeable hands and character-specific accessories. Collect them in a Set of 3 for $52.99; a Case of 14 for $229.99; or we have Caesar and Koba for $18.99 each. McFarlane Toys is proud to announce the third series of action figures based on the video game Halo 4! 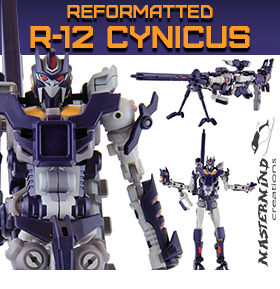 Just like the previous series, this line brings fans all-new, never-before-seen characters, weapons, and accessories to your figure collection. Each highly detailed figure will stand approximately six inches tall and includes an average of 25 points of articulation! The set of 3 includes Jul ‘Mdama, Spartan Thorne, and Commander Palmer for $37.99. You can also get them in the Case of 8 for $94.99 or individually for $12.99 each.